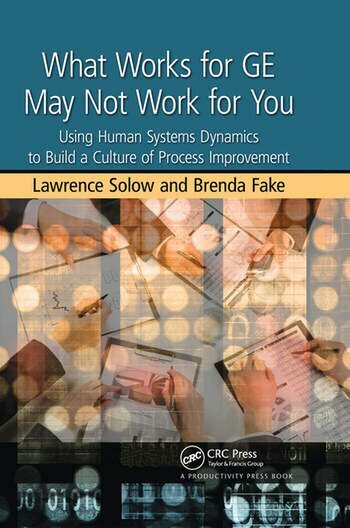 What Works for GE May Not Work for You: Using Human Systems Dynamics to Build a Culture of Process Improvement provides new tools for managing and sustaining process improvement in today’s complex non-linear environments and helps readers apply new, relevant theory to their own management practices. With more than 50 combined years of change management and process improvement consulting experience, the authors offer valuable practical insights for creating dynamic organizational change. The first section of the book describes the key bodies of knowledge and process improvement processes (Lean, Six Sigma, and Human Systems Dynamics) used throughout the text. The next two sections focus on the case story of TryinHard Marine. The authors first highlight the dynamics of a typical linear process improvement implementation. They then present ways to combat a range of complex, non-linear, and emergent organizational issues as they arise during the implementation of a Six Sigma initiative. The last part explains how to assess readiness to begin a process improvement initiative, select consultants and internal "Belt" candidates, and choose the appropriate tools for projects. 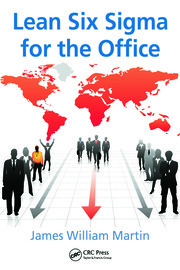 The authors also introduce additional tools and concepts to enable adaptive action at all levels of an organization. This book provides useful information for thinking and behaving in adaptive ways that can be applied to any organization. By using the concepts, models, and tools presented, readers can improve their own business improvement processes. The book has an accompanying website with more information. President and Principal Consultant, 3-D Change, Inc.
Lawrence Solow is president of the consulting practice 3-D Change, Inc. He is a certified Human Systems Dynamics (HSD) Professional and a Six Sigma Black Belt. Brenda Fake is founder and principal of the consulting firm O-2 Optimizing Organizations. She is a certified Human Systems Dynamics (HSD) Professional and a Six Sigma Green Belt. "I found What Works for GE May Not Work for You: Using Human Systems Dynamics to Build a Culture of Process Improvement to be theoretically sound, practical, and easy to read and understand. Blending traditional models and new thinking, the authors have certainly provided food for thought for those struggling to make process improvement a way of life in their teams and organizations. I believe these ideas and tools can help you build capacity for yourself, your team, and your organization to respond creatively and effectively to complex change." "This book is a profound shift for those seeking to implement continuous improvement efforts within their organization. The system may be suffering for many reasons—customers not getting what they want and need, organizations not getting the extra mileage out of the tremendous efforts requiring employee attention and engagement, and individuals not feeling they are making a significant difference. Process improvement efforts have been designed as linear or mechanistic approaches to fix technical problems. However, it is human interaction that accomplishes the tasks and humans are complex and definitely not linear! Solow and Fake offer a unique approach for organizations experiencing rapid change. They offer tips for beginning or re-engaging in a continuous improvement effort. Most importantly, the authors paint a picture of the dynamics which can cause derailment and offer a different language for moving projects forward. 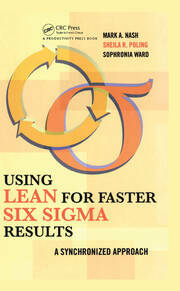 This is a ‘must-read’ book for anyone involved in Lean, Six Sigma or other process improvement initiatives." "We’d all like to think our rational, logical approaches to process improvement will work every time—but too often they don’t. Why? The world is messy, things happen we didn’t predict, and random events get in the way. This book approaches process improvement from the perspective of the world as it is, not as we wish it was. It incorporates several disciplines we typically don’t access when we’re doing process improvement: chaos theory, Lean, Six Sigma, and Human Systems Dynamics. Want to increase your success rate on process improvement? Read this book and incorporate its ideas into your approach." "As an industrial statistician, I have found only half the job was finding statistical solutions to the technical problems. The other half was finding ways to enable the organization to leverage the statistical results. Unfortunately, making changes stick often is where we fail because we don’t recognize the messy reality of our situation. This book provides practical approaches to effectively implementing process improvements that adapt to the situation at hand rather than trying to fit a linear and overly specific ‘square peg’ solution into the chaotic ‘round hole’ of the real world. Solow and Fake use an effective comparison of two stories to highlight effective approaches to implementing a process improvement culture. The traditional version is so true-to-life, you will think they are writing about your organization. The adaptive change version addresses all those failure modes you have encountered in making change. Read this for a more effective approach to implementing your changes. 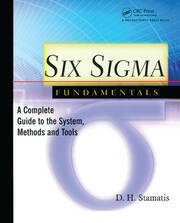 This book will make your Lean Six Sigma efforts stick."